Welcome To This Brand New, Original Series Featuring 3 Dental Leaders In An Uncensored, No-Holds-Barred Discussion That Cuts Through Misinformation & Confusion, Providing The Clarity You Desperately Need For Marketing Your Practice The Right Way, Right Now! This one short video alone could MASSIVELY improve your bottom line. 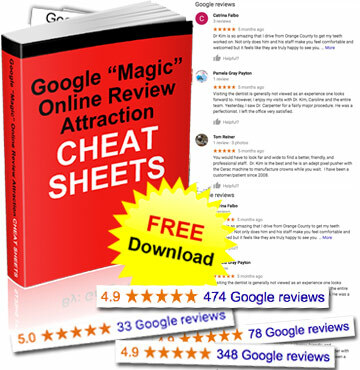 Graig: Handling negative reviews and do you respond, do you bury them – we all know removing them is near impossible. Graig: It can be done but it’s not a method that’s consistent. I think obviously it starts at we don’t ask the angry patients for reviews and we don’t poke them, we try to smooth that out before they go out and do some damage, we can’t stop it after that point. I know you have some interesting tactics that sure you use and I am a huge fan of them because I think it’s thought-out and I think it’s thought-out because sometimes you respond to them, sometimes you don’t respond to them. Sometimes you reach out personally. So talk a little bit about when you get dinged, oh and by the way don’t take it personally, it happens. We’re all in business, you’re not going to make everyone happy. So let’s talk about tomorrow, you get a bad one. Josh: I think first and foremost, the most important thing is before you do anything at all, wait 24 to 48 hours because your initial reaction is always anger no matter what. No matter even if there’s some truth to it or not, you’re always going to read it as some hyperbole, you’re always going to read it as some exaggeration. You’re going to be emotionally invested into it for 24 to 48 hours. After that it starts to wear off and you start to be able to think sanely about it. So first get out of that first 24 to 48 hours before you do anything. Step number one to me is always read the review again and then go read the Terms of Service for whatever site that the review is on. So if that’s Yelp, the Yelp Terms of Service or for Google reviews, the Google Terms of Service. Those are the rules that those two websites have that reviews have to play by and so if you can find some way that they violated the terms of service, you can flag that review and hopefully someone will review it and get it removed. So that’s step number one. Graig: It’s an honest true blue review. Josh: So now we’ve got to deal with it. I think the first thing to do is let crazy be crazy. So if the review is crazy, I think most consumers are savvy enough to be able to read crazy and say oh that person is crazy and sort of mentally discard that. After that, if it’s not a crazy review, if it’s honest maybe just something didn’t go right whatever it may be, then I think the first thing is contact the patient. You have the ability to contact that patient directly, you have their contact information, maybe it’s a text, maybe it’s an email, maybe it’s a phone call, whatever you think is going to work the best so that patient that’s most likely to get them to contact you back, then open a dialogue. Josh: Or edit or change it to a positive because you’ve listen to them. That’s a great opportunity to make this a good experience because how many times have you had bad consumer experiences at a business and no one ever reached out, no one ever tried to make it right, whatever it is. So sometimes just the effort of reaching out goes a million miles. If you drop the ball, you screwed something up, a billing problem, you didn’t submit to their insurance fast enough and some issue happen or you messed up decoding that, whatever it is if you screwed up somehow, I always say offer more remedy. For dentists, it’s easy to do bleaching trays something like that, electric toothbrush or something. I wouldn’t offer somebody a remedy if you didn’t do something wrong, if they’re just really high maintenance and/or kind of a problem patient or whatever but if you drop the ball somehow, try to make it right. The biggest key is I wouldn’t argue with them. Once you get them on the phone, once you get them where you’re contacting them, always be polite, always be respectful, always be thankful for their input. Without their input, how would you ever know how your business is doing? Acknowledge their feelings, I love that. It’s not so much telling them that you were wrong. It’s saying like ‘Greg, I told you that joke and you were offended by that joke. I’m sorry that you were offended’. I’m not sorry I told him the joke, I’m just sorry he was offended by it. It’s more like I’m sorry that you felt this about your appointment. I’m not so much apologizing or anything that happened in the appointment, I’m apologizing that you felt whatever; that does where your feelings. Graig: You’re just relating to their experience. Josh: Just acknowledging their feelings. Absolutely, and then at the end of the day you just don’t want to get into a heated debate with them. Graig: Well, I think if you get into a heated debate with them and they just say they just review you down Google right and then you get into a heated debate and maybe a tiny argument, they get off the phone with you and then they’re like ‘yeah, you know what? I’m going to rip off report, Yelp, Scam bug and now it’s just a mushroom cloud. So you do have to tread lightly with that and let them just get it out if they really go off the rails. Josh: Yes, just let them vent. Just listen and then say thank you so much. If that’s the end of your relationship with them as a patient and the dentist, then that’s fine and move it on, but I think simply a lot of times just by listening to somebody especially if they’re saying irrational, by listening to them, letting them vent, telling them…if you did something wrong, you’re going to remedy it or if there was a system malfunction that you’re going to try to fix. One of my favorite lines that I use in these conversations when they happen are, you know that’s a real coachable moment for me and whatever team member Suzie. This is going to be a real coachable moment for Suzie and I and I think that kind of tells them like hey, you’re going to sit down with that person that they had the issue with and have a conversation and try to correct it, remedy it; and a lot of times those steps go a long way to making them to go back and delete a review. I never asked anybody to go back and delete a review. It’s their own prerogative, I don’t want it influence that but many times they will just by showing that you care. One word of WARNING: This action plan will disappear without notice! So don’t delay.